In an era where technology, patient care, diagnosis, and delivery of treatment have all improved, the doctors and staff at Lake Forest Dental Associates challenge ourselves to stay on the cutting edge. We provide comprehensive dental care, so we not only identify problems—we come up with long-term solutions that fit your lifestyle and needs. 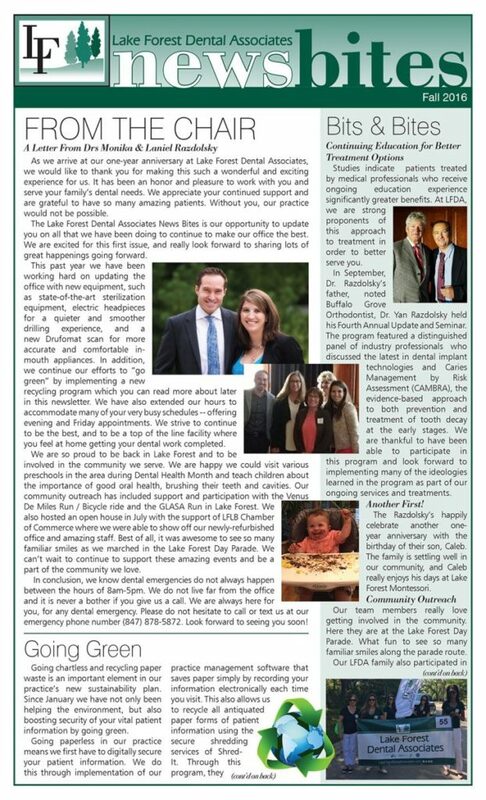 How is Lake Forest Dental Associates unique? We use the best quality materials and the most experienced and credible laboratory technicians in the state. Our warm and welcoming staff work hard to make each patient feel special. We treat each patient with care, because when they are in our practice, they are part of our family. We strive to provide the gentlest dentistry possible, and offer nitrous oxide for patients with dental anxiety. We present all treatment options and inform patients of the pros and cons of each treatment, allowing our patients decide what is best for them; from minor restorations to full-mouth rehabilitation and anywhere in between. We have flexible office hours and can accommodate difficult schedules upon request.